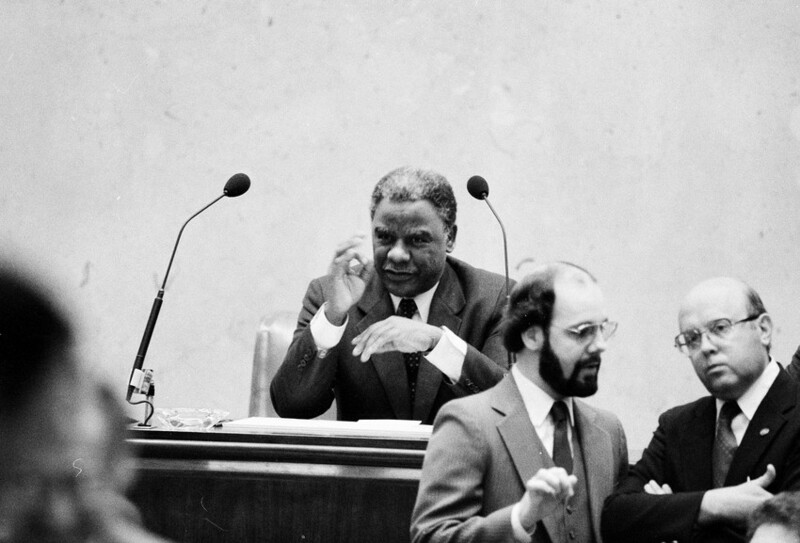 Former Chicago Mayor Harold Washington during a 1983 City Council hearing. There are probably hundreds of thousands of people who have first-hand, shared memories of Harold Washington becoming Chicago&apos;s first black mayor and of Barack Obama becoming the country&apos;s first African-American president. There are certainly several dozen people (at least) who were actively involved in both efforts. In 1983, when Washington broke decades of Democratic machine control, the immediate reaction was steadfast, uncompromising opposition that coalesced around political power and racial justifications made to stymie every one of the new mayor&apos;s moves. For the first half of Washington&apos;s initial term, every single step was blocked by legislative opposition in the City Council. In his inner circle there were ongoing debates as to how to deal with this intransigence. Some wanted compromise, some wanted a fight. Washington was forced to govern by veto. Ultimately, Washington — a former boxer — chose to fight, and the struggle became part of both history and pop culture. These days, we remember the clash with fondness: “Council Wars,” the Eddies, the 29 vs. the 21. But at the time, it seemed like a paralyzing and ugly mire. A little more than halfway through Washington’s first term, there was a special aldermanic election in four Chicago wards. You might consider these analogous to the congressional midterm elections. But unlike Obama’s “shellacking” in 2010, in 1985 all four seats were won by Washington supporters. The people rewarded Washington for his passion and punished the opposition for its pigheadedness. With a 25 to 25 City Council split, Washington himself became the deciding vote. He then spent the rest of his first term pushing through his agenda wholesale. In the spring of 1987, Washington won re-election easily, and greatly increased his majority in the City Council. Again, the people rewarded his committment and spirit. He’d totally broken the opposition — until he died a few months later. Curiously, many of the folks around Obama now, who were also around Washington, were those who argued against staunch fighting. They were, in the main, arguing for compromise. And, as we saw in Obama&apos;s first two years (when he had the majority that Washington briefly had at the end of his first term) instead of pushing through his agenda, Obama negotiated against himself nearly every step of the way. It seems to be in Obama&apos;s nature to try to be everyone&apos;s president. It is also undoubtedly in Obama&apos;s nature to try to find common ground. He is not the brilliant and messy volcano that Washington was. As we were all reminded in that nerve-wracking first debate against Mitt Romney, Obama can be frosty and alienated from the process. Obama has written that he came to Chicago in 1985 because of the Washington revolution; yet in his first term, Obama and much of his Chicago team ignored the lessons provided by Washington about fighting on principle, often ceding his own political power and making the path to re-election and to real change harder. Obama won this time by a comfortable margin, but we shouldn&apos;t interpret the victory as a wholesale approbation of his policies and practices. The Republicans helped plenty, by putting up a candidate they could barely stand. The grassroots came alive for Obama after it looked like Mitt Romney might actually pull it off, and after Obama came back with a fiery spirit in the last month of the campaign. In other words, when he began fighting, hard, for his political life. That’s the lesson here, Mr. President. If you were able to defy history’s racial bias the first time and economics to get elected the second, then consider that your most important campaign is still ahead of you: the 2014 midterms. Think about Harold and how very fiercely he fought. Think of Washington&apos;s 26th vote and draw the line from him to you. Think of all he would have done, and couldn&apos;t do, and of all that&apos;s still within your grasp.